Los Angeles Railway PCC no. 3025 is “locked and loaded” aboard a flatcar at the St. Louis Car Company factory. The photo dates to late 1937. The 3025 is part of the first order LARY placed with the builders. 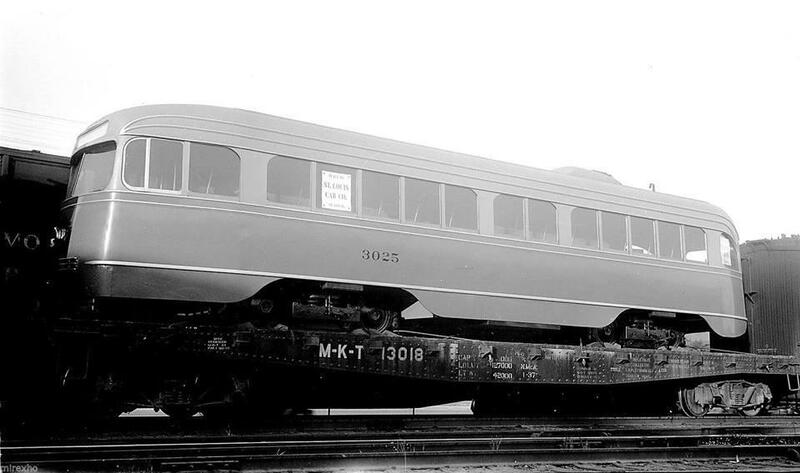 The first 20 cars, 3001 to 3020, were outfitted with Westinghouse electrical components, while cars 3021 to 3060 contained General Electric equipment. All of the LA PCCs enjoyed a pampered life in the land of sun, palm trees and good weather. The LARY PCC’s were received with great civic pride, and fan fair. Mayor Frank Shaw proclaimed March 22-28th as Transportation Week in honor of the new cars. There was only one slight “glitch” in getting the PCCs into service. 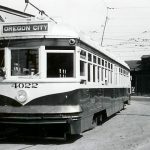 A long-standing city ordinance requiring streetcars to be equipped with Eclipse Fenders kept the new beauties out of service for a short time. The LARY actually drew up specs to mount Fenders to the front of the cars. But common sense prevailed and the PCCs were allowed to finally make their long awaited debut. Child star Shirley Temple posed in front of and at the controls of the 3002. 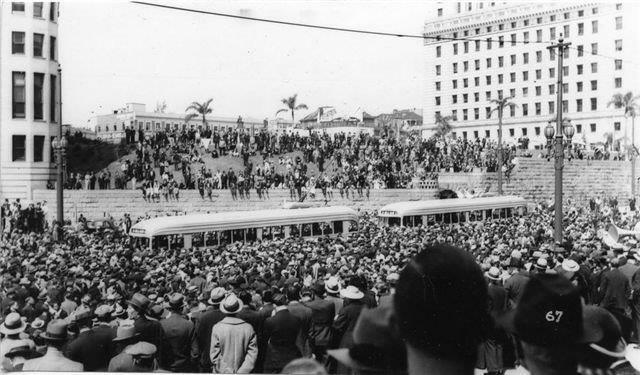 Thousands of Angelenos and Civic leaders attended the ceremonies on the Spring Street side of City Hall. This type of “hoopla” was never to be repeated when new buses were placed into service. PCCs delivered to such rust belt systems such as Philadelphia, Chicago, Boston and Brooklyn operated in very severe winter conditions on salt-socked, snow-covered streets. As a result, those rust belt PCCs might last 20 at best, with NO resale value except for scrap. . . but not so in Los Angeles. “Pride of ownership” and good weather resulted in pristine-looking PCCs gliding along streets of LA for decades. The P-1s from 1937 were prematurely retired at just 25 years of age. However due to their excellent condition at retirement, new buyers were found for just about all of LA’s beautiful PCCs . . . but that’s another story. What is not to be over looked is PCC’s were designed to be one man cars but the labor union of the LARY instigated the passage of a law mandated conductors. As I understand the cars initially all had to pass thru South Park shops first for the addition of a conductor’s station in the middle. That attitude – by the people of Los Angles – must have implied something to the estate of Huntington who were still trying to run the system and not go bankrupt paying unfair labor costs. 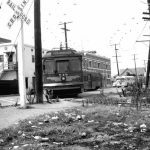 The St. Louis Car Company delivered 141 PCC cars to Twin City Rapid Transit in the late 1940s. The first one was an air-electric, very similar to these LARy cars, while all the others were all-electrics with small square windows and standee windows above. They were delivered in batches over three years or so. They only stayed in the Minneapolis – St. Paul area for seven years at most, as a takeover battle for the company resulted in new management which quickly changed the whole system over to buses. The PCC cars were all sold off by the end of 1953, with twenty going to Shaker Heights, thirty going to the Newark City Subway, and the rest going to Mexico City. The Newark cars turned out to be among the luckiest of all, as the City Subway was entirely off street and underground, with but one grade crossing. The cars were all meticulously maintained, and stored underground in surplus station space. Those cars lasted in regular service untill 2001, by which time a planned expansion of the system involved federal funding and the Americans with Disabilities Act. So the PCCs were replaced by light rail vehicles. Ten or eleven of those cars found their way to San Francisco, where they’re now working the F-line. It’s an odd twist of history that these cars with a lifelong rust belt history are among the best preserved, still in service in California in the 21st century. Great comment, Duncan – thank you! – Ed. How odd. First in one of her earliest films, “Bright Eyes”, the mother of little Shirley’s character is run down and killed not by an auto but by an actual Pacific Electric bus…thus giving local transit a black eye in the minds of the public. A few years later, in their infinite wisdom, they trot out the little princess to promote the PCC’s! What were the marketing people putting in their morning java?!! The 11 former Twin Cities/Newark cars in service today on SF MUNI’s “F” line are numbered 1070 through 1080. The LATL orange/green/white livery is represented on Car 1080. As many know, the LARY orange/yellow livery is shown on Car 1053, a former SEPTA PCC, and the Pacific Electric PCC livery is shown on 1061, another SEPTA car. 1061 is currently back at Brookville for it’s second and MAJOR rebuild, and the orange will be closer to the PE original color than was the first paint job in 1995. Now all we need is a car with the LAMTA light green/dark green/white livery and MUNI will have all the LA liveries! An added something to ponder. Bermuda had a somewhat railway system at this time that was built to deal with the same problem Los Angeles had…transit or automobile? They skipped electrifying and didn’t build the extra loop line, running instead with a sort of gas powered set up (McKeen plus). [At this point, look up that history, then come back here.] 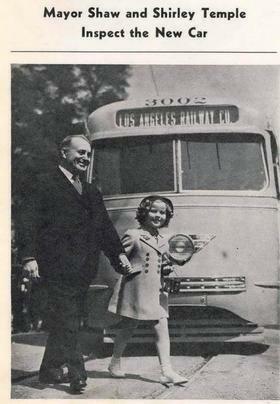 So next year, in July 1938, Shirley goes on vacation to Bermuda (read this): http://bernews.com/2014/02/recalling-shirley-temple-blacks-bermuda-visit/. That Castle Harbour Hotel was just beyond the planned loop. Apparently our young star was invited to ride a 22 mile long private narrow gage railway during this visit (reported elsewhere). If someone had thought to get Little Miss “Conductor Number One” to promote electrification, extension of the loop, and adoption of those spanking new PCC cars over there, Bermuda might still be running trains today! And PCC to boot!! Instead, the hotel has been demolished and replaced…historic graves on the golf course have been desecrated…and Bermuda is awash in the autotraps. There’s no business like show business….That’s Allllll Folks!